This is one of Microscale/Superscale's great Carrier Air Wing sheets. These sheets were super as they provided markings for several different aircraft. 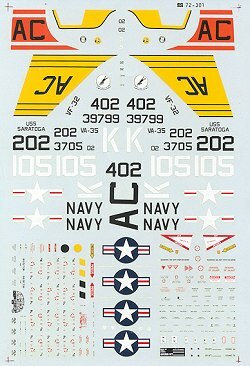 This sheet is no different, having three different planes from various periods of time of the air wing. First is an F8F-2 from VF-31 in 1948/49, one of the few units to operate the Bearcat. It is in overall gloss sea blue. 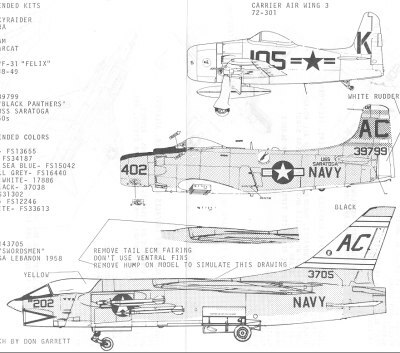 Next is an AD-6 (A-1H) from VA-35, a unit that went on to fly A-6 Intruders. This one is from the early 1960s and is in the light gull grey over white scheme. A large orange tail band adds a splash of color. From VF-32 is this F8U-1 (F-8A). It also is in light gull grey and white with yellow markings. Some modification to existing kits is needed to portray this Crusader from 1958. Bearcat - Monogram or Sword. Monogram is easy to build but Sword is more detailed. A-1 - Fujimi or Hasegawa will be most folks' choice, but Airfix and Takara are also decent kits. For the F-8, you have the older Hasegawa and Heller kits. Supposedly, Academy has one in the works, but that has been such for over two years. Any current kit you choose will need quite a bit of modification in order to be backdated to F-8A standards. If you would like your product reviewed fairly and quickly by a site that has 200,000 visitors a month, please contact me or see other details in the Note to Contributors.